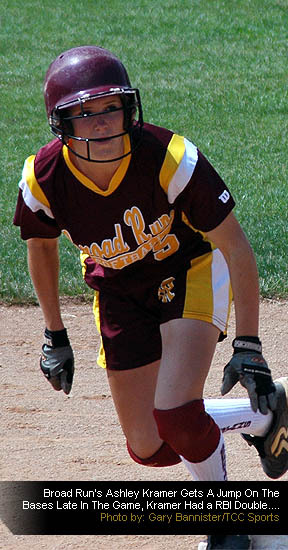 RADFORD, VA - With their 28-0 record on the line, the Broad Run Spartans came through with an impressive performance to win the 2007 Group AA Softball State Championship. The Spartans got another complete game performance from star pitcher Caitlyn Delahaba, who struck out 12 New Kent hitters in the 8-0 win, and also threw a no-hitter. Delahaba also added two hits that helped Broad Run score 3 runs in the first 3 innings to help secure the title. New Kent played hard but eventually 5 errors in the field did them in. Broad Run scored first in the top of the 2nd inning when Jenn Soroka stepped in for an injured Courtney Kramer, who left the game with a deep leg bruise from a foul ball that hit her in the ankle. Soroka stepped the plate with 2 strikes in Kramer's at bat and delivered a hard ground ball to second base that scored Alba Creus from third. In the top of the 3rd inning, Delahaba came to the plate and crushed a single to left with two Spartans on base, and both scored when New Kent's leftfielder couldn't handle the line drive. The ball went all the way to the fence and Broad Run made it 3-0 heading into the bottom of the 3rd inning. With a 3-0 lead, most of the Spartans knew at that time that it was in the bag, especially with Delahaba pitching the way she was. "I knew when we put the first run on the scoreboard that we probably had it with Caitlyn on the mound," said firstbaseman Karla Powell. "The way she was pitching, we didn't need many runs to win." Broad Run's Ed Steele echoed that comment as well. "Most teams don't know what to do when they see Caitlyn," Steele said. "When they fall behind by 3 runs, most of them kind of wilt and give in because she makes it really hard on them." In the top of the 7th inning, Courtney Kramer re-entered the game and drilled a two strike fastball down the third baseline to bring home two more runs and extend the Spartan lead to 7-0. Broad Run's Anna Blessing then scored from third on the next hit from Kaitlyn Tiplady to make it 8-0, and the inning ended wihen the hobbling Kramer was thrown out heading to the plate. Kramer had a tough day with her leg injury, but winning it all made everything feel better. "My leg actually hurt really bad, but I really wanted to hit the ball hard," an emotional Kramer said after the game. As one of the only seniors on the squad, Kramer wanted to let everyone know how she felt about her teammates. "I really appreciate all the girls and how they pumped us all up before the game, I just love them all." 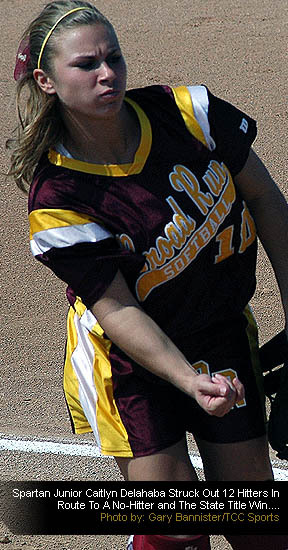 Kramer was in tears on the post-game show as she ended her career as a state champion at Broad Run. Also seen shedding some tears was head coach Ed Steele, who said it was a great moment to get the championship trophy from his two seniors. "They are my two captains, and they provided us with great leadership all season," Steele said. "They were tremendous emotional leaders and we will have a hard time replacing them next season." Saturday's win over New Kent marked the second time in the last decade that Steele's softball program had won a state championship. When asked about how the second title felt, Steele just smiled. "Each time has been different because each team is different," Steele said. "There really is no feeling like it. This title will be as great to me as any I've ever won." Broad Run is ranked in the top 5 in the country and potentially will have a claim to the National Championship with the final USA Today rankings set to come out next week. Steele wasn't worried about being called National Champs though. "That isn't anything we can control, but we'll take whatever ranking they give us." With the win, Broad Run improved to 29-0 on the season and claimed the school's second state title in softball. Check back for the replay of the state championship game tonight on the Gameday Radio Network and this story will continued to be updated throughout the weekend.